TTI Job Benchmarking can be completed using any of the below reports and questionnaire combinations. To provide a comprehensive job benchmark process and provide stellar results, we recommend including these four key reports, all of which add value in a different way. When combined, these reports “let the job talk” in a robust and powerful way. Your candidates will complete the Trimetrix HD report. The results of that report will be used for the Gap Report and the Job/Talent comparison reports. When conducting a benchmark, we will identify a group of Subject Matter Experts (SME’s) within your organization. Each of the SME’s will complete a job questionnaire. This questionnaire is designed to identify the traits of the job, not the person. Each subject matter expert (SME) completes his or her own job report. The Multi Respondent Report, otherwise known as “the benchmark” is a combination of all the individual job reports. 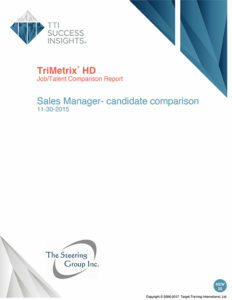 This report allows you to later compare individuals to a job benchmark. The Gap Report allows you to compare one person to one job benchmark. We use the gap report to identify the job match of a candidate or current employee.